Excessive sweating can cause employees to lose important minerals their bodies need to function properly. Safeguard workers in hot weather by offering heat stress relief with Medi-Lyte electrolyte tablets. Each tablet contains calcium carbonate, potassium chloride, and magnesium oxide – essential active ingredients that ease muscle cramping and fatigue caused by electrolyte loss through sweating. Tablets have no added sodium and are lactose- and sugar-free to accommodate employees with various health concerns. 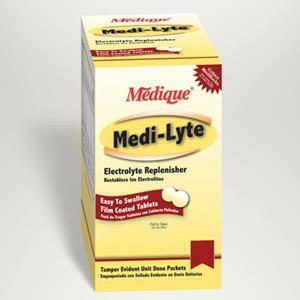 Medique® Medi-Lyte Electrolyte Replenisher Tablets are a convenient choice for hot work environments. A handy dispenser box comes stocked with 50 individually wrapped doses of two tablets each. Instructions are printed on each package to ensure proper use and tablets are coated, making them easy to swallow. Help workers control heat stress and reduce the risk of heat exhaustion and heat stroke by replenishing lost electrolytes. Maintain employee health and productivity in hot temperatures by providing drinks, shade, breaks, and heat stress relief products like Medi-Lyte electrolyte tablets.